Black Friday is the friday after Thanksgiving. In 2018, Black Friday is November 24. This day is generally perceived as the busiest shopping day of the year. Also, the annual holiday shopping season will not really begin without a start of a vibrant Black Friday. For the economy, this day plays a crucial role which helps all types of companies from small/medium-sized to big ones increase revenues, improve brands and build up reputation as well as customer loyalty. Just few days after Black Friday, Cyber Monday takes place on November 27, 2018 and keeps the similar excitement among shoppers and retailers. The term was created by marketing agencies to persuade people to shop online. As online shopping is an increasing trend, has Cyber Monday never been that important for your online business. On Black Friday itself, 74.2 million shopped in 2015. The NRF annual survey said that 99.8 million people would shop. That is the lowest level of Black Friday participation since 2011. Only 87 million shopped in 2014, 92 million in 2013, 89 million in 2012 and 85 million in 2011. Nearly 35 million people shopped on Thanksgiving Day. That’s more than 25.6 million who went out in 2014. It’s still less than the 45 million who shopped in 2013, but on par with the 35 million in 2012. (Source: “Thanksgiving Weekend Shopping Brings Crowds,” National Retail Federation, November 29, 2015. The number of people shopping over the three-day Black Friday weekend was lower, too. Only 135.7 million said they’d go out, less than the 140.1 million who said they would in 2014. Spending is down, too. Here’s the breakout. The recession created a permanent shift to thrift in retail trends. That’s not just a search for the lowest price, but also an interest in finding the best value for the price. The 2014 Black Friday survey showed the same. Nearly half (47.1 percent) said they looked in advertising circulars for the best deals, 35 percent signed up for retailer’s emails, 20.2 percent paid attention to TV commercials, and 21.3 percent relied on word of mouth. Smartphones and tablets are used much more than in the past to find the bargains. Less than half (45.4 percent) of those who own smartphones, and just about two-thirds (47.4 percent) of those who own tablets, use them to purchase products online. Gift cards are becoming more popular. Eighteen percent of holiday shoppers used them in 2016. Almost half of people received a gift card on Christmas morning. That’s because people are more likely to ask for gift cards than clothing, DVDs, or jewelry. The NRF reported that stores hired between 640,000 and 690,000 seasonal workers in 2016. That’s down from the 700,000 workers they said they’d hire in 2015, and the 713,780 they did hire in 2014. That’s much less than the 764,750 workers hired in 2013. At least it’s not as bad as the 263,820 workers hired in 2008. 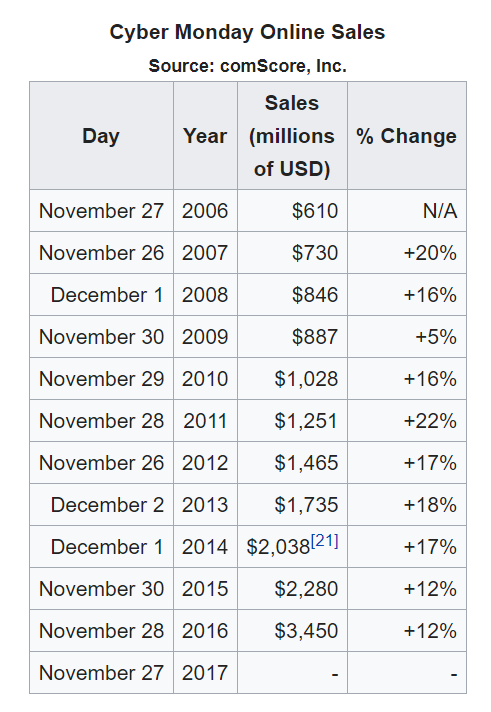 In 2010, comScore reported the first-ever $1 billion online shopping day ($1028M), an increase of 16 percent over 2009. In 2011, comScore reported that Cyber Week saw US consumers spend over $6 billion online from November 28 to December 2. In 2012, comScore reported that Cyber Monday saw a 17% increase in sales from 2011, totaling $1.465 billion. In 2013, Cyber Monday sales continued their growth and recorded their highest grossing day ever at $2.29 billion. In 2015, the average planned expenditure is $361 per person. 46 percent people expect to pay with credit cards and 43 percent expect to pay with debit cards. Sales are up 8.1% as of 6 p.m. ET, according to IBM Digital Analytics. The average order is $131.66, flat with last year, though the number of transactions is up and people are buying more items on average per order. In 2017, according to Adobe Digital Insights, Cyber Monday hit a new record with $3.45 billion, and it’s the first time that online sales in one single day surpass $3 billion in US history. The numbers are up 12.1% from a year earlier. In 2017, shoppers spent a combined total of $5.27 billion online on Thanksgiving and Black Friday, which was a new record. For 2018, expect a combined $5.57 billion to be spent, which is an increase of 5.70 percent. 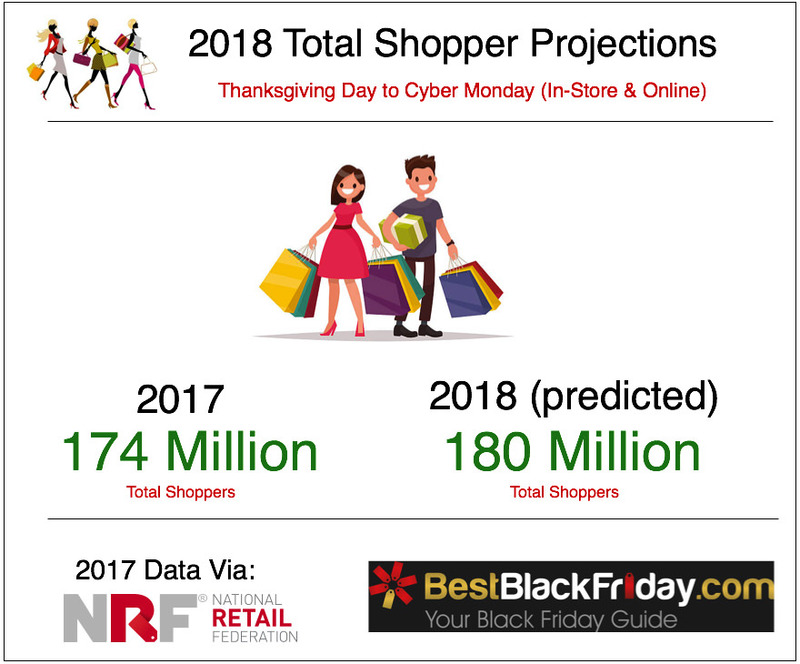 Last year, we predicted that Amazon, Walmart, and eBay would be the most popular online stores on Black Friday and Thanksgiving. While Amazon and Walmart both finished in the top three, eBay actually regressed from its strong position in previous years. For 2018, expect Amazon and Walmart to dominate online sales. While the No. 3 spot is still up for grabs between Best Buy and Target, expect Target to edge them out. While using a desktop computer is still a more hassle-free way to shop, mobile devices — including smartphones and tablets — are the preferred method for many shoppers on Black Friday. For one, they offer convenience that traditional desktops and laptops do not. Additionally, mobile websites are drastically improving. It is easier than ever to make a purchase at your favorite store’s website using your smartphone, whether it be directly on their site or via an app. On Black Friday, expect $1.4 billion in sales using mobile devices, which would be an increase of $200 million from the $1.2 billion spent last year. On Thanksgiving, expect $850 million in sales using mobile devices, which would be an increase of $79 million from the $771 million spent last year. Black November’s expansion means that shoppers are spreading out their buying over more days, but Thanksgiving weekend remains the most popular time of the month to get a deal. 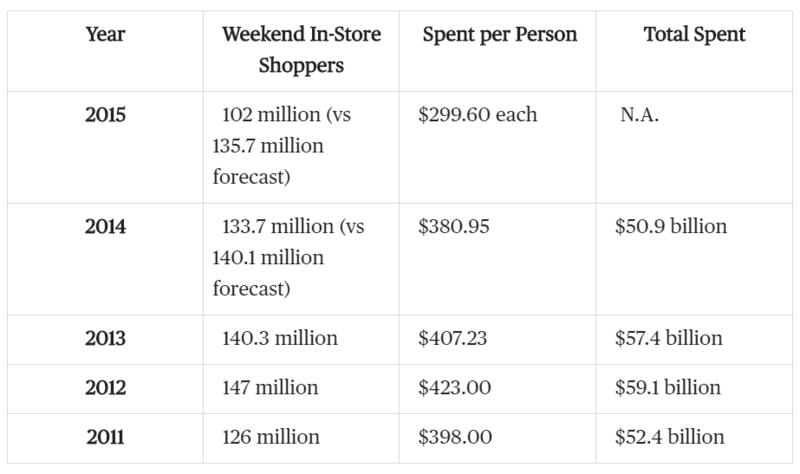 In 2015, shoppers spent an average of $299.60 during the weekend. In 2016, shoppers spent an average of $289.19. For 2017, expect shoppers to average $295.33 for the weekend. The National Retail Federation states that over a third of shoppers managed to only purchase items that were on sale. That percentage is likely going to remain at around 33 percent for 2018. Many people complete the bulk of their holiday shopping during Thanksgiving weekend, and it is impossible to get every single item on sale. According to the National Retail Federation, 151 million people shopped during Thanksgiving weekend in 2015. In 2016, that number jumped to 154.4 million people. Expect that figure to increase to around 156 million for 2017. More people are taking part in Thanksgiving weekend shopping, and the figure should see a slow and steady increase every single year. Despite the fact that numerous retail experts have been predicting Cyber Monday’s demise in recent years, it is only growing stronger. Here were the total sales and strictly mobile sales from previous years and a projection for 2017. As it seems to do every single year, Cyber Monday set a record last year for total online sales in a single day. Shoppers spent $3.45 billion in 2016, which was $380 million more than in 2015. While the $3.45 billion figure is impressive, it really did not beat Black Friday’s $3.34 billion online total by that much. Regardless, Cyber Monday is as popular than ever, and you should expect at least $3.81 billion in sales for 2017. It is important to remember that many Cyber Monday deals actually go live on Saturday and Sunday, which means the $3.45 billion figure from last year is probably a bit understated when taking Cyber Monday as a whole. Like on Black Friday and Thanksgiving, mobile sales ate up a large percentage of spending on Cyber Monday. 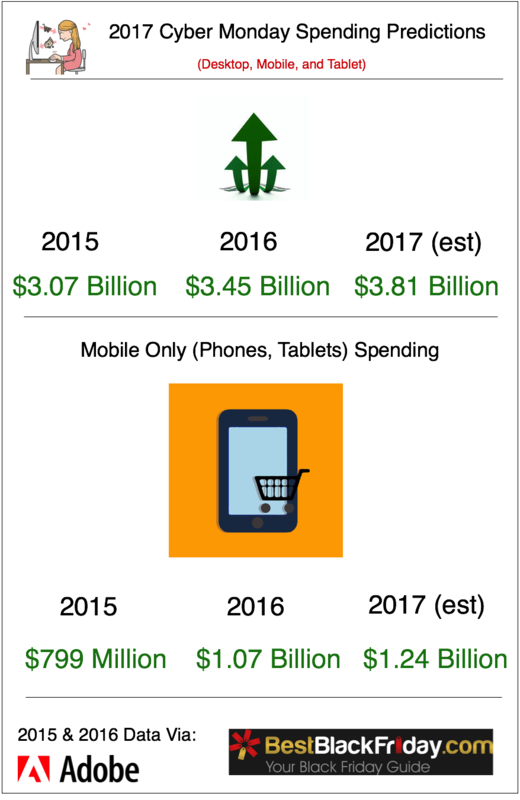 Shoppers spent $1.07 billion on mobile in 2016, which was $271 million more than in 2015. This trend will continue, and mobile sales should be around $1.24 billion. 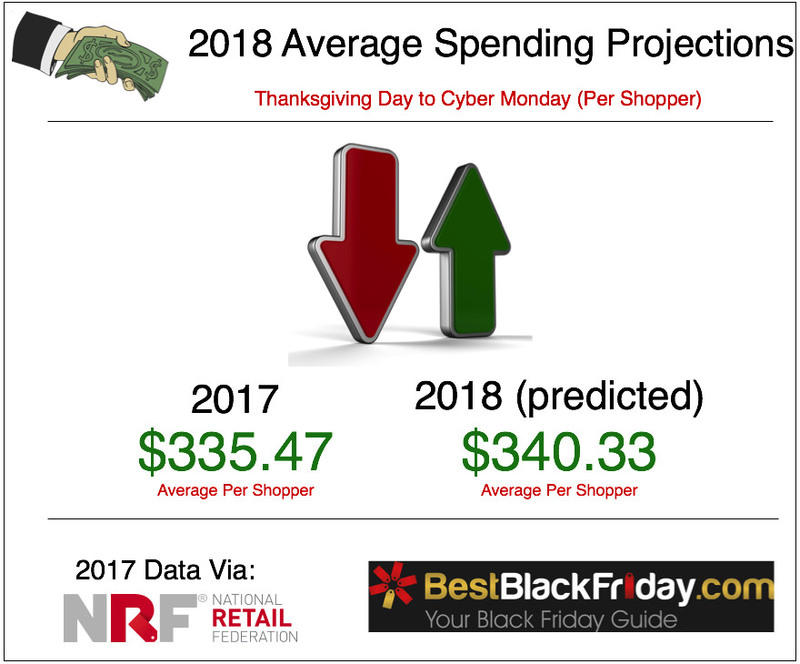 Strangely enough, Black Friday is still expected to do more in mobile sales despite having less overall online spending. Online spending and sales data from 2016 came from Adobe . 2015 data also came from Adobe.